The most visible change is the addition of a new “Evening” theme, which turns the background a shade of orange intended for “easier reading”—basically jumping on the same blue-light-blocking bandwagon responsible for apps like F.lux and Twilight, Amazon’s Blue Shade, Google Play Books’s Night Reading mode, and Apple’s Night Shift. Well, good for Barnes & Noble; having more options isn’t a bad thing. The new Nook app also supports the “Enhanced NOOK Book format” which can embed multimedia into e-books. I hadn’t even known that as a thing for Barnes & Noble, but I suppose if you’re going to compete with iBooks you have to start somewhere. Here’s a listing of some free Enhanced Nook e-books, courtesy of Nate Hoffelder of The Digital Reader. Another format change involves bringing font size control support to “Serial Reads,” the serialized e-book format for Nook. I’ve never poked at Serial Reads, given that it seems to center on romance novels, which I’ve never been really interested in, but it puzzles me that they’d alter their e-book format enough that they had to change their reading app so you could do something as basic as resizing fonts in it. The new Nook app also supports showing results in Apple’s “Spotlight search”—the system-wide search feature implemented in iOS 9. 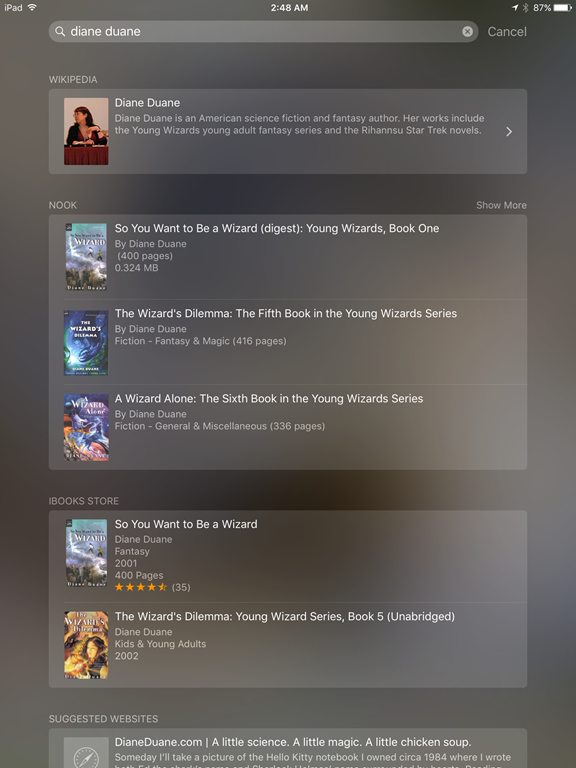 If you swipe left from the home screen and type in a search phrase, it will now bring up any matching results from your Nook library as well as other areas. Apart from bug fixes and performance improvements, the only other changes mentioned have to do with showing more “related books” on a given e-book’s details page, and allowing users to search and download free e-books—which is nice, but it’s not exactly obvious how to do it. There don’t seem to be any options listed on the app menu centering around searching and downloading free books. Apparently if you type something in the search box, it can turn up free e-books for download, but there’s nothing that comes right out and says so. I’d think most people would assume the search box is limited to their own personal library. At any rate, it’s nice to see Barnes & Noble still cares enough about the Nook to stick in some improvements. They may not be quite as flashy as Amazon’s new “Page Flip,” which showed up in a recent update to the Amazon Kindle app, but at least they’re something. 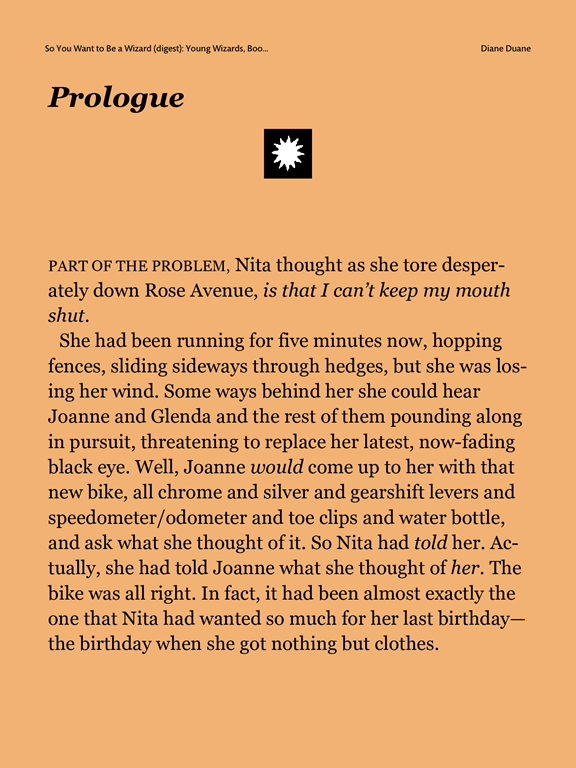 One other odd thing I just noticed, which I didn’t when I looked at the iOS Nook app in April, is that this app does away with the annoying spaces between paragraphs in Diane Duane’s Young Wizards book that shows up in the Windows version. That’s a nice little feature. It would be better if there were a way to give it a more prominent paragraph indentation, too, but oh well. Next Next post: Browser the Library Cat will stay, but how about the bigotry behind his town’s name?